I'm a theater director and actor in Budapest. The leader at the theatre named CENTRAL. My wife is an exellent actress and we have trhee sons. after the foolish and running year there is no better place to stop for one or two weeks, return to the family, to the sun, the morning and evenings together and feel that it is worth it. This house is maintained with love, which you can see and feel. In a beautiful garden, surrounded by vineyards and nature, Tamas created an escape for the soul. We stayed for one week and were more than happy to find all we needed. Everything is clean, and well organized. The spot is away from it all but still very close to the main road and nearby villages. An ideal place to enjoy it all the lake, the vine and the Balaton villages and sight seeings. We didn't use the pool much but that was due to the unusually cold weather for that time of the year. Also our daughter was to young for the deep water. There is a sand area for kids under one of the trees and a small BBQ. We would go back anytime and recommend this house especially for grownups. But if the kids are old enough to enjoy the pool, this really is the perfect house. This is a charming house in a perfect setting/location surrounded by vineyards and a gorgeous sunset. We stayed in the house for two weeks at the beginning of August and could not have wished for a more ideal holiday. The house is very tidy, well equipped and clean. Tamas is constantly making improvements to make his guests' stay more pleasant. The garden is extremely well maintained. We always enjoy the fact that he house is relatively secluded, but still within an adeqaute distance from the main road and nearby villages. We would highly recommend "orgonas" for a holiday in Balaton. "This area is one of the nicest in the country, the landscape, the nature, the lake Balaton is fantastic! The house and its surroundings has everything one would need for a perfect holiday: authentic style, beautiful garden and pool, great view. We had a great time!" "The cottage at Kaptalantoti completely lived up to our expectations for a good holiday. 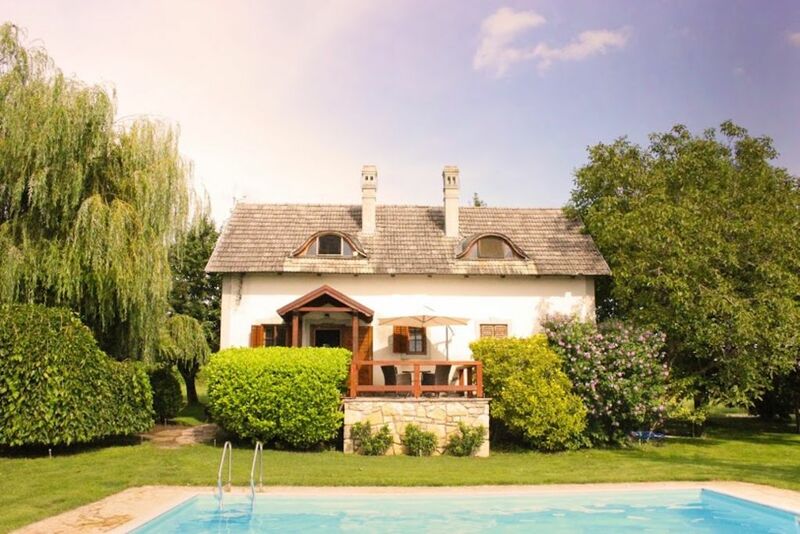 Calmly situated amongst vineyards with beautiful uninterrupted views of the Badacsony Hills. The house is cosy, clean and well kept. The garden is quite open yet felt private and beside the covered 'veranda' it was always possible to find a shady place under the trees. We very much enjoyed the swimming pool. The only reservation about the pool is that the overall depth is about 1.50m and would not be suitable for young children. We enjoyed the comfort and peacefulness of the house and found plenty of variety for activities in the area. It was a perfect holiday." "A beautiful and relaxing place to stay. If you are looking for a holiday to 'get away from it all', but still have the opportunity from being not too far away if the children need entertainiment, or shopping this is a place i would definately recommend. My partner and i, with 2 children aged 10 and 6 years stayed here for 10 nights, and there was something for everyone. We all loved the house and pool, and there are so many place to visit, we didn't even visit half of the places i had planned!! The children loved nearby Lake Balaton, we found quiet and busy places to visit on the Lake. The Thermal spas are not far away, and a definete to visit! We all really enjoyed Hungary, the country is a place we would all like to visit again." "Very clean, beautiful surroundings, lovely pool and an amazing view with an easy access to the facility. We had a great holiday there!" This is the unic part of north lake Balaton, named Kali Basin. To reach the spot you need a car. The tranquil surranding with the old vulcanos around the district is unnforgettable. You can find good restorants and wine everywhere around.